Nobody likes going to funerals. For a start off, you’re dealing with having lost someone you knew, or you’re there to support a friend who’s lost someone. Then you have to dress up in smart, dark clothing, head off to a church or chapel that you may not be familiar with, sit on uncomfortable seats and hope like mad that half a billion relatives don’t stand up and give interminable eulogies. Then you’ve got the trip to the graveside, following the hearse. This procession of cars behind a hearse going from the church/mosque/chapel/synagogue/other significant ceremonial place is known as a cortege. Or cortège if you want the fancy French spelling. This is supposed to be a stately procession. The idea here is that the hearse leads the way, usually taking the minister/priest/rabbi and the coffin. The chief mourners (i.e. immediate family) will come next in the procession. To take part in the cortege, set out from the chapel or wherever the funeral was held and follow the hearse. Don’t dawdle. When you are driving in the cortege, you get to have your headlights on dip during the day (here’s where you hope you can override those automatically dipping headlights). Also don’t forget to turn your headlights off when you get to the cemetery or everybody will get a flat battery. Don’t overtake other people in the procession and let the hearse set the pace. Well, in most situations, you let the hearse set the pace. At my father-in-law’s funeral, we (a) had quite a long way to go to get to the cemetery, (b) had a hearse with a fairly powerful engine and (c) had a petrol-head vicar who might have been egging the hearse driver on. 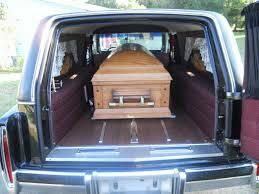 I don’t know how fast that hearse was going, but my husband didn’t half have to plant the boot in the Ford Fairmont we had back then to keep up with the hearse. Other family members struggled to keep up the pace and one bunch of my in-laws who had a less zesty Honda Odyssey MPV were Not Impressed. It would have been a traffic cop’s dream situation: a whole line of people all over the speed limit, quota of speeding tickets filled in one day and a great story about I Clocked A Hearse Doing 120+ To The Cemetery. What if you are not part of the funeral procession? What’s the best thing to do when you see a long line of cars with their headlights on dip containing drivers in dark suits following a hearse? These days, you probably need to check to make sure that it isn’t just a bunch of car-pooling businesspeople with daytime running lights, but usually the presence of a hearse, children in the car and several cars that are too old to have daytime running lights are a bit of a giveaway. What you may not know if you see a funeral procession is that you have to give way to it. This means all the cars in the procession. In New South Wales, it’s actually against the law to break into the funeral procession, cut in or otherwise interfere with the smooth process of getting mourners to the graveside on time for the final part of saying goodbye. Even if it wasn’t the law, it’s common decency and respect for others. You can see why if you can imagine the same situation taking place on foot. If you saw the minister and the pallbearers carrying the coffin on foot along a walkway, followed by black-clad grieving relatives wielding tissues, you wouldn’t overtake them and get into the procession if you were approaching from the rear. (In other words, overtaking Cousin Hannah with all the kids in tow so you walk between her and Cousin Jeff before overtaking Cousin Jeff and Uncle Timothy…) If you were approaching them at right angles, you wouldn’t barge straight on through them, getting in the way. The same rules of courtesy apply when you are in a car rather than on foot. Dipped headlights are the motoring equivalent of black clothes, tissues and flags at half-mast. Respect them. Unfortunately, a number of people have reported rude drivers cutting in to funeral processions, either by not giving way to them or by overtaking and interrupting the procession. Obviously, traffic lights don’t count (if the hearse driver has any sense, he/she will drop the speed so other members of the procession can keep up and not get lost.). If you do lose sight of the rest of the cortege, your phone will come in handy (hands-free if you’re the driver). Cemeteries are usually located outside central business areas and may involve obscure suburban streets. Having another relative with the phone on in other cars will help if you do get lost or separated from the rest of the procession. Just don’t forget to turn it off when you get to the cemetery. If you are not part of the procession, then give way. Pull over and let them pass you if you accidentally find yourself in the middle of a cortege. Yes, it’s inconvenient and you don’t want to. However, the people in the procession don’t want to be there either and they’re going through a lot more inconvenience than you. If you’re late for a meeting, your clients/boss/co-workers understand (even if it’s a job interview, this might earn you points for courtesy). Or go around another way if you’re really in a hurry. Yes, life is busy these days. But it’s not so busy that you can’t be respectful of other people’s feelings and show some respect. Have other people had experiences with funeral processions that were interrupted by rude drivers cutting in? Or any other examples of a cortege that didn’t quite go according to the textbook plan? Share your stories here. Private Fleet Car Review: 2016 Kia Carnival S Petrol. Designing a people mover for the road is simple: take a box, slap on four wheels and you’re done. But what do you do if you want a truly stylish people mover? Many companies have tried and some have failed. Some have come out with award winners, such as Honda and their Odyssey. To make a BIG people mover look nice is no easy task yet Korea’s Kia have done so with their 2016 Carnival. Carnival is also the vehicle of choice for a company that specialises in producing vehicles for disabled and wheelchair bound people, Automobility. Kia has fitted the Carnival with a 3.3L V6 and a 2.2L diesel four cylinder, with both available through the four level range. Power and torque from the petrol engine is 206 kW (6000 rpm) and 336 torques, at a high 5200 revs. This contributes to the woeful economy of the petrol powered version, with Kia’s own figures quoting 15.9L of unleaded for every 100 klicks covered in an urban environment, right where the Carnival’s main usage would be. It also explains an 80L fuel tank being fitted. Compare that to 147 kW (3800 rpm) and a more than handy 400 Nm of torque between 1750 and 2500 rpm, with six litres of diesel LESS being consumed over 100 kilometres. Transmission is a six speed auto and it’s one of the best around. Under almost all driving circumstances, gear changes were invisible, with the flick of the rev counter the only indication of a change. It’s responsive, reacting to throttle input instantly and works well enough in hustling the 2048 kg beastie along nicely. There’s plenty of whoa to match the go, with a beautifully weighted pedal feel, with bite on the 320mm/324mm discs, front and rear, as soon as you touch the brake pedal and hauls the Carnival up nicely. Ride quality surprised, surprised in that it was softer than expected. The S rolls on 17 inch steel wheels, with 235/65 rubber, with that sidewall height accounting for some of it, surely. Driven at appropriate speed over the speed calming bumps locally had the Carnival barely registering their existence. Handling, however, wasn’t compromised, with a surefooted and deft feel to the steering being communicated. Turn in was mostly well balanced, with perhaps too much for some drivers. A Wheel Thing was certainly surprised by the alacrity at which the Carnival responded to a turn of the tiller. Somehow, Kia’s design team have taken a box and made it look European. Complete with the brand’s “tiger nose” signature, the sweeping headlights and a kick in the window line, the looks bely the length, the near two metre width and 1755 mm height. They’ve engineered in a 11.2 metre turning circle, wonderful for the size. There’s no shortage of interior space, with a 3060 mm wheelbase, even with seating for eight. Kia have spent time and money here as it’s a beautiful place to be and the mechanisms for folding the seats are no more complicated than pulling a lever. There’s not just split folding either, as each seat is individually mounted on rails. There’s aircon controls for the rear and with vents for both middle and rear seats. Family friendly? Oh yes, indeedy. With seats folded and removed, there’s a massive 4022L of space available. All the seats themselves are wonderfully comfortable, especially for the driver and passenger. They also face a simple yet elegant dash, complete with dashboard mounted chiller for SLi and Platinum (the S gets a non chilled unit), a huge centre console storage locker, some of the best ergonomics you’ll see for a family car and a pleasing mix of plastcs, both for tactile and visual looks. Being the entry level model, it’s a small screen for the radio (Really wish the Koreans would do RDS…) and a small display for the dash, with a insert that shows what can be shown further up the range (3.5 inch OLED display for Si and SLi, 7 inch screen for Platinum). Being a family car, it’s loaded with safety, with airbags, electronics for driving aids (the Platinum gets the extra toppings like Lane Awareness and Rear Cross Traffic Alert) plus the 7 year unlimited kilometre warranty to sweeten the deal. Lob in 3 USB charging ports and 12V sockets, 14 cup and bottle holders and it’s abundantly clear just how much thought has gone into the Carnival. The U.S. market is fickle, predominantly a 4WD ute or pickup market, yet the Carnival (Sedona in the states) has cut through enough to be named the best minivan. Even with the S being the entry level model, There’s plenty to love about the big people mover, bar the fuel economy for the petrol engine. It’s fun, this Carnival. For the complete rundown on the range, click here: The incredible 8 seater Kia Carnival. If you have children over school age, you probably have to ferry them around to school, sports, parties, activities and heaps more. What’s more, given our busy schedules these days, it’s usually all done in a rush. Or at least getting everybody into the car with everything they’re supposed to have is done in a rush. Traffic lights and speed limits stop the actual driving being done in a rush. Oh, the freedom that comes when your teenager gets their P-plate and can take themselves to activities! Strange that they’re probably thinking the same thing. However, while the madness is going on, it’s a wise idea to have your car well equipped with everything that you might need. All those family-sized SUVs, station wagons and MPVs come with stacks of storage space, so you may as well take advantage of it and put the stuff you are going to need in into it. Careful planning will mean that your car and what’s in it will help save your sanity. Easily stored food that can be fed to small sports players after training who forgot to pack a post-training snack. This helps fend off the whingeing to visit McDonalds and grizzles fuels by low blood sugar. Dried fruit and nuts store well. If you have a diabetic in the family, a good supply of barley sugars, jelly beans or little sachets of sugar picked up in cafés are another must. A first aid kit with plenty of sticking plasters. Vital when some kid decides to kill time at the traffic lights by picking off a scab and bleeding all over the place. Paracetamol or aspirin. Make sure it’s the sort that doesn’t need to be taken in water. A spare jacket or sweatshirt, preferably several. Inevitably, there will come a day when it suddenly buckets down with a southerly buster and someone failed to bring warm clothes. Sometimes, that person is you. A few grooming tools – hairbrush or comb and a few hair ties. If you’re really in a hurry in the mornings and you have girls with long hair, the girls can brush their own hair in the car while travelling along. For that matter, so can you (not recommended if one member of the family has headlice). Books to keep the troops amused if you break down or have to wait for ages for the road works. Large thin ones that tuck into back-of-the-seat pockets are easy to store. Have several handy to avoid squabbles. Wipes. For dealing with the blood after putting a bandage on the child who picked off the scab. Also good for cleaning faces. Hand sanitiser. Even if you find a public toilet when some child is busting to pee, said toilet may not have soap. Enough said. A travel potty. For when you are stuck in traffic on the M1 or Sydney Harbour Bridge or whatever and someone needs to pee. It sounds disgusting but it’s a lot better than having someone wet their pants, as the smell will linger in the seat for ages. Just remember to empty it at the end of your journey. For Number 1 only, not Number 2. A towel. For cleaning up vomit if someone throws up, for wiping down fogged windscreens, for protecting seats if someone fell into the mud at the park, for folding into a neck support when someone falls asleep, for using as a blanket… If you were into the sci-fi cult classic Hitchhiker’s Guide To The Galaxy, then you’ll have heard of the usefulness of towels. Like Ford Prefect, know where your towel is. (Question: the alien Ford Prefect in that series adopted that name because these cars were so common on the roads. If the late Douglas Adams was writing his series today, what would he have called this character? Toyota Corolla?). Iconic British brand, Jaguar, continues its renaissance with the public unveiling of its first SUV, the F-Pace, at the Frankfurt Motor Show. Not a brand to be reticent about showing off its new products, the car started its public career by breaking the world record for a car driving a loop-the-loop, with a height at an astonishing 19.08 metres. See the incredible feat here: Jaguar F-Pace record setting loop To quote Ian Callum, Jaguar’s head of design, “The Jaguar F-PACE is an SUV with the soul of a sports car.” This was proven, conclusively, with expert British stunt driver Terry Grant at the wheel of the F-Pace in its dramatic unveiling. To commemorate the release of Jaguar’s first ever SUV, there will be an exclusive run of just 2000 “First Edition” models, with a choice of just two colours, Caesium Blue and Halcyon Gold, and two engines, the 3.0L supercharged petrol V6 provoking the road with a 280 kW/450 Nm output, or the outstanding 700 Nm diesel of the same capacity. F-Pace will also offer a 2.0L diesel, with 132 kW and a handy 430 Nm (1750 to 2500 rpm), a 3.0L V6 with a slightly detuned 250 kW with the weight of the F-Pace starting from just over 1800 kg with all variants being of an all wheel drive configuration. Jaguar quotes a miserly 5.3L of diesel being sipped,in a combined drive cycle, for the entry diesel,from a 60 litre tank. It’ll see 100 kmh in under nine seconds on its way to a 208 kmh top speed. The higher torque diesel will be expecting a 66L tank, 241 kmh top speed and a 0-100 klick time of just over six seconds. Moving to the 250 kW petrol and Jaguar quotes 5.8 seconds to 100, a 250 kmh top speed and a tick under 9.0L per 100 kms of 98 RON consumed from a 63L tank. The only change from the 280kW V6 is a 5.5 second 100 kmh time. As one could guess, the F-Pace is loaded with technology. The AWD system employs a transfer case, with multi-plate wet clutch and chain drive, connected to the front axle setup. Normal drive sees all torque delivered to the rear but when called upon,will deliver a 50/50 split in 165 milliseconds. Jaguar says the front differential is the toughest and strongest of any seen in an AWD Jaguar, to the point that if the rear tyres were on polished ice, the system would still put enough torque through the front wheels to pull away, using only the front wheels. Being seen more and more in off road capable vehicles is electronic programming to adapt to varying road surfaces; Jaguar has the ASR, Adaptive Surface Response, replacing the original Rain/Ice/Snow mode. With the parameters now expanded to cover almost any road or terrain surface, a driver will have a traction system covering light and greasy surfaces through to a measure of deep snow or gravel. Naturally, being a Jaguar, the program leaves the driving to the driver, by switching to the appropriate setting automatically and within four seconds. There’s a Torque Vectoring system, splitting torque between the driven wheels, to back up the ASR, a stereo camera system for the Autonomous Emergency Braking, a 12.3 inch LCD “Virtual Instrument” display for the driver offering four themes and a 3D style navigation display. Lob in the aluminuim chassis, a 2847 mm wheelbase which provides plenty of interior room, an optional four zone climate control system, seat pockets designed specifically for smartphones (plus plenty of charging points), a centre console with a ten inch screen and 60GB solid state hard drive that come under the umbrella name of InControl Touch Pro (including access to Apple and Android devices), a built in wifi hotspot allowing up to eight devices to access, it’s clear that Jaguar isn’t about speed and good looks, there’s family friendly technology on board as well. Take it for a drive and you’ll be onboard with the Integral Link suspension design; Jaguar have investigated and separated the loading on the suspension, with lateral and longitudinal components specifically engineered to deal with the individual loadings. Allowing softer bushes for the longitudinal loading allow excellent energy absorption and provide a smoother, more quiet ride. Castor stiffness is improved, providing better stability under braking. The steering was re-engineered, with an additional mounting point and by increasing the chassis’ rotational stiffness there’s more of the 22 inch diameter tyre contact patch holding on to the tarmac. The wheels themselves were specifically designed by the Jaguar Land Rover Special Vehicle Operations division, alongside the 265/40 doughnuts. Exterior design is pure, classic, Jaguar; from the J shaped LED driving lights, F-Type inspired haunches, tail lights and bonnet vents. The bold, upright grille and bonnet bulge promise power, assertive attitude, adaptive LED headlights and a full five seater interior tell you immediately that this F-Pace is a Jaguar like no other. This is a car, the Ford Fiesta ST, that A Wheel Thing has been watching from afar for sometime and due to a minor scheduling hiccup, finally got to try. Did it live up to expectations? Read on. In essence, the ST is the fire breathing example of the range, with a 134 kW/240 Nm 1.6L EcoBoost petrol engine. Peak power is on tap at 5700 revs, but the talking point is the mesa flat delivery of torque, from 1600 to 5000 rpm. Mated to one of the best sorted six speed manuals going and a fluid, smooth clutch and spot on brakes, it’s a fantastic combination. Additional tech comes in the form of Hill Start Assist. Body style is a three door hatch and the test car came clad in a sparkling, eye catching, Molten Orange metallic paint (optional extra, at $450 cost), 17 inch alloys with a five spoke, hammerhead, design with 205/40 rubber, slim line headlights with LED driving lights, sports body kit, dual exhaust tips and rear parking sensors. It’s compact at just over four metres in length and sits on a 2490 mm wheelbase. It’s a squat track too, with a 1465 and 1447 mm track, front and rear, accounting for the go-kart like handling. Interior kit runs to push button start/stop, auto headlights and wipers, snug and form fitting Recaro sports seats, a Sony audio system (with the soon to be replaced overdose of buttons), the Microsoft powered Sync system for voice activation on certain services such as audio, a smartly laid out aircon control set, a non touchscreen display of 4.2 inches and a sports steering wheel with a “just right” feel to the hand. The engine is, quite simply, a pearler; aside from a system that pipes noise into the cabin for more aural feedback, the torque and free revving, spritely nature of the powerplant brings a sense of life and pizzazz to the drive. There’s that immensely usable torque delivery, allowing flexibility around town and on the freeway. Backed by that instinctive, short throw gear change and thought direct steering, it’s a sports hatch for the exuberant driver. The ST is also kitted with a Torque Vectoring system, which effectively delivers torque via a special differential to the wheel the system feels needs more. Economy? Brilliant; Ford quotes 6.2L per 100 kilometres of unleaded (it will run E10 to 98 RON) from a 48L tank. A Wheel Thing matched that figure. Downside, for some, is the sports handling and ride; the steering is responsive but perhaps too responsive for some,with even a twitch seeing a change of direction. In order to have the ST sit as flat as it does, the sports oriented suspension picks up every lump, bump and five cent piece sized ripple on the road. Having said that, if this bothers a driver then perhaps they’ve not researched their choice of buying well enough. There’s also the bland, hard plastics inside. It’s an outdated, uncomfortable look and feel, with little or no give and being all black lends a claustrophobic feel to the cabin. The only real spots of brightwork were the scuff plates,surrounds to the gear lever and gear knob itself and highlights on the tiller. The dash itself (along with the aircon_ is simple to read but dated with dash style LCD backlit displays. Offsetting that is the approximately 280L of carry space behind the rear seats which increases to around 960L with seats folded. There’s ‘bags aplenty, including thorax and driver’s knee, plus the usual suite of electronic safety items such as Electronic Brake Distribution. It’s a performance bargain, the Ford Fiesta ST, with a starting price of just under $29800.00 (September 2015 pricing). It’s a ripper to look at, a hoot to drive, cheap to run and has enough onboard tech and space to prove useful to most. The expectations were of a fun car with an interior in need of an update. Expectations met. We’ve had automatic dusk-sensing headlights. We’ve had cornering headlights and auto-levelling headlights. Now the latest in active safety for headlights is being seen in a number of new models: automatic dipping headlights. In a way, automatically dipping headlights use the same sort of light sensing technology as dusk-sensing headlights. However, instead of realising that there aren’t enough photons hitting the sensors so the lights come on, this technology realises that all of a sudden there are far too many photons coming in so those high-beam headlights had better dip pronto so the oncoming driver doesn’t get dazzled. Half of me thinks that this is a great idea. 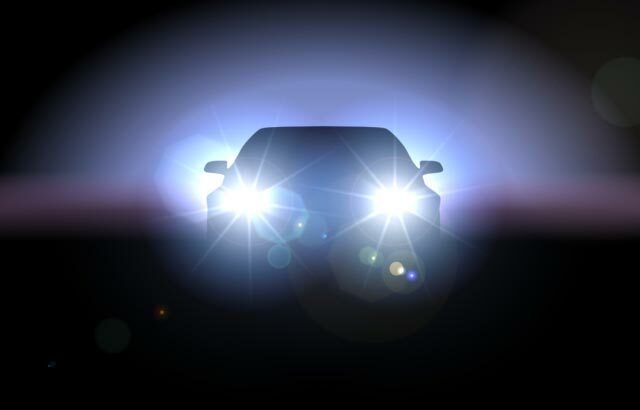 Haven’t we all had experiences when an oncoming driver doesn’t dip his or her headlights until the last minute, leaving you blinking and frantically trying to regain your night vision? (Safety hint: pull over if you can until you’re no longer dazzled). It’s always a bit of a puzzle as to what to do: do you flicker your lights between dipped and full to let the driver know that he/she needs to dip in return – and run the risk of having two dazzled drivers driving at speed in opposite directions with all the risks involved in that – or whether you just grit your teeth and mutter something along the lines of “stupid idiot”, to put it mildly. Sometimes, you ARE that driver who forgets to dip the lights. There’s also the situation where one or both of you decide to take the headlights off dip just a fraction of a second too early, giving the oncoming driver the full blast of your headlights on full (no joke with some of those very bright modern headlights). Auto dipping headlights would certainly get rid of this problem. However, there’s another part of me that doesn’t like this idea. This part of me kind of likes deciding when to dip the lights as an oncoming driver approaches. It’s kind of like playing chicken legally and safely – who’s going to be the first to dip the lights? There have been a few incidents during long night-time drives on those road trips to the relatives who live a long, long way off that deciding when to dip the headlights has been the main way to keep the driver (and the passengers) alert, as it breaks up the monotony of night-time driving. If it hadn’t been for the shall-we-dip-yet-or-shall-we-wait decision, the risk of nodding off with the hypnotic effect of white lines and reflectors flicking past repetitively would have been a lot higher. This part of me thinks that this “safety feature” to keep you awake, focussed and alert outweighs the risk of a bit of dazzling. I also have a host of questions. Do these headlights have a manual override so you can dip the headlights if you want to, like when you’re part of a funeral cortege? Do they dip automatically when you get to a built-up area? Do they pick up cyclists, motorbikes and those cars that only have one working headlight? You never get to test-drive new cars at night (even car salespeople need to sleep sometimes), so how do you test this out? What do other people think about the prospect of auto-dimming headlights? Love them or hate them? Private Fleet Car Review: 2016 Ford Mondeo Titanium Wagon & Hatch. Ford Australia is due to cease local manufacturing in 2016, which will see the end of the locally made Territory and its sibling, the venerable Falcon. Sales of the famous nameplate have slumped in recent years but the blue oval has plans, big plans….A Wheel Thing looks at two diesel powered versions of the car that’s slated to be the replacement of the Falcon. Simply put, the Ford Mondeo Titanium is what the Australian Ford Falcon should be: elegant, economic, technologically advanced and a cracker drive. The cars provided, the Titanium wagon and hatch, came with a torquey 2.0L diesel engine, with the slightly lower mass of the hatch seeing 6.7L per 100 km and the wagon 6.9L per 100 km with the cars driven in a purely urban environment. There’s some grunt to this pocket sized dynamo, with 132 kW (3500 rpm) and a stonking 400 torques on tap between 2000 to 2500 rpm, with plenty of get up and go from 1500 revs. Transmissions were six speed autos, with the wagon getting a slick shifting dual clutch version. Ford quotes just over five litres per hundred from a 62 litre tank for a combined cycle; potentially offering a range of one thousand kilometres plus emits just 140 grams per 100 kilometres. The hatch weighs 1749 kg and just 40 kg more for the wagon. Cargo capacity with rear seats up is decent enough: 557L and 730L which increases to 1356L and 1605L respectively. Each came with a power assisted tailgate, coupled with a fast paced musical chime to alert you the gate was lowering, operated by a button in the base of the door or by a double press on the key fob. It’s just a small example of the tech the Titanium is laden with; swivelling and self levelling headlights, active grille shutters, power operated steering column, rain sensing wipers with sensitivity adjustment and multi coloured ambient lighting. Add in the Sync2 system, with voice activated climate control and navigation, Bluetooth with text message read out and music search with verbal commands. There’s even heating for the rear seats. Throw in adaptive suspension, parking assist, pre-collision alert, lane keeping sensors, memory seating and panoramic glass roofs and the Titanium duo come well armed and ready to fight. Seats were leather all around, with a high level of comfort and support,plus heating for the front AND rear seats (no ventilation or cooling however) plus were memory capable for three drivers. The downside to the interior was the excessive waste of usable plastic on the centre section of the dash; the buttons themselves were clearly marked but it’s an inefficient usage of the space available. What was appreciated was the far reaching DAB+ audio system; the sensitivity level seemed higher than a couple of other cars tested recently that were also fitted with DAB+ tuners. Operated via the touch screen, searching a storing was simple, as was using the screen itself. Split into quarters, you can select more options for the aircon, navigation, audio and settings. The exterior is dramatic, eye catching, with Ford’s distinctive Kinetic design strategy on display. Slim line headlights with integrated LED running lights, fluted bonnet and rear bumper integrated exhaust tips add stylish subtlety. The wheel and tyre combination is causing a few eyebrows to be raised in certain circles, primarily because of the design of the alloys. A Wheel Thing can’t say they would have been the design of choice either. Size was 235/45/18 with solid grip all around. Naturally there’s a visible difference at the rear but not as dramatic as expected. The hatch folds down into the tail lights with a fluid curve whilst the rear section of the wagon manages to look stylish without being boxy. Tailgate up and seats down, it’s clear just how roomy the wagon actually is. There was a noticeable and somewhat odd difference between the two on the road; seat of the pants conversation told a story of the hatch feeling as if it was rolling on the top of the suspension, whilst the wagon felt more tied down on the road. It felt softer over bumps, more prone to wallowing slightly and didn’t turn in quite as tightly as the wagon. The front was also noticeable for the scarping from the nose’s overhang. With almost the same road weight, acceleration and economy from the two was virtually identical; the torque of the diesel made around town driving and overtaking a doddle. A simple flex of the ankle was all that was required to see the numbers flicker upwards with a throaty road from the front, surprising devoid of overt diesel chatter. As you would expect from a premium Euro car, safety is paramount and delivered in bucketloads: Adaptive Cruise Control, Blind Spot Alert, Pre-Collision Avoidance with Pedestrian Detection, rear seat belts with SRS Airbags fitted, Park Assist, Lane Departure Warning and Driver’s Knee Airbag, with most of these features standard across the three model range. The Ford Mondeo nameplate has been in Australia for close to two decades, it’s been a moderately successful seller but improvements to the quality and the look have increased its appeal. Bar the odd ride quality of the hatch, A Wheel Thing came away mightily impressed with the pair and has no qualms about recommending either to a buyer. 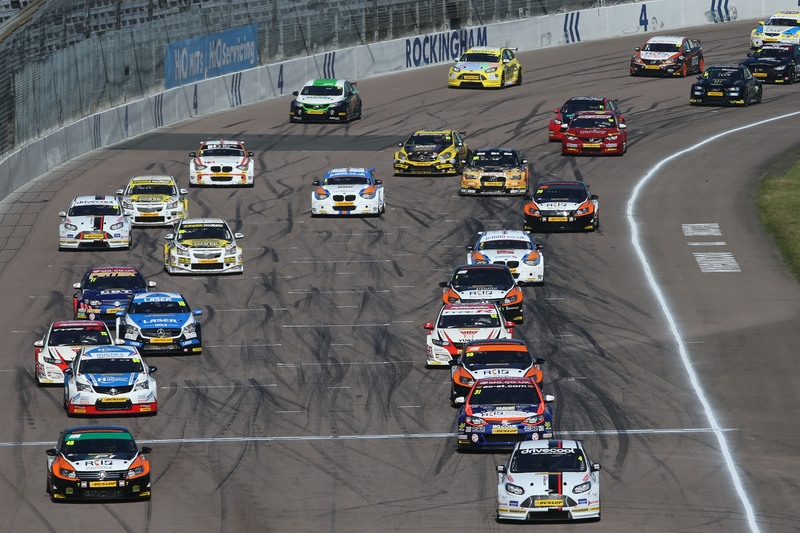 Whenever the British Touring Car Championship heads to Rockingham, you can guarantee a fascinating days’ racing. The title fight has been set ablaze with 5 drivers all within 30 points of each other, following a truly knightly Knockhill for hometown hero Shedden. As Motorbase man Mat Jackson plants his titanic Ford on pole during qualifying and BMR appear to be rediscovering their mojo, who will come out on top when the fat lady sings? From the second the lights were out, Gordon Shedden made clear his intentions for vengeance upon the rest of the field. As Mat Jackson powered off into a lead he would never lose, in typical Flash-ion, Shedden made light work of those in his way and was soon not only up to his original 3rd place, but charging up behind the Ford. Despite securing pole position for race two with a blistering time, Shedden was never able to catch the flying Ford of Jackson, who was able to manage both the gap and his tyres to an eventual 1.8 second lead as proceedings came to a close. It was not the lead battle that captured the imagination of the fans; it was however the scrap for all the top 10 positions. After making an excellent start from the 6th row of the grid, Cook made his way up to 6th and was even fighting to get past the Honda of Neal. But the demands of the Rockingham circuit do take their toll on the soft tyre, meaning he would fall back to an eventual 13th. All eyes fell on the epic struggles between Moffat, Cook, Ingram, Jordan and Turkington. The BMR Volkswagen did not have the same dominance I was expecting; after a collision and broken suspension, Plato would return to the track to qualify only 12th. While Smith achieved a well earned podium, he was struggling to keep pace with the haunting Honda. My hero of race one however had to be the Mercedes of Adam Morgan who fought back not only from 19th to 9th at the flag, but also secured 2nd on the grid for race two. It was very nearly an 8th for Morgan, following a catastrophic rubber failure (read: puncture) for Neal on the last lap who plummeted down the order. Credit also should go to Jeff Smith in the Eurotech Honda who placed his machine 5th for the second race. As the field charged into the first corner for race 2, Shedden led Jackson from Morgan. What was happening behind was anyone’s guess. Star of race two fast became Josh Cook who Power Maxed back up to 4th position (couldn’t resist). In fact, Cook was lapping at the same place as Flash Gordon himself! While Jackson attempted to fend off Morgan, Josh approached from the rear. With two laps to go, Cook in the Chevrolet became the fastest driver on track, and set upon Adam Morgan. Unfortunately for Cook, Morgan is one of the hardest drivers to pass in the BTCC grid. As everyone thought it was over, Cook made his move into the final chicane, passing the Mercedes and getting the first ever podium for both himself and Power Maxed Racing! Josh Cook has made a solid entry for move of the season with that delectable beauty. 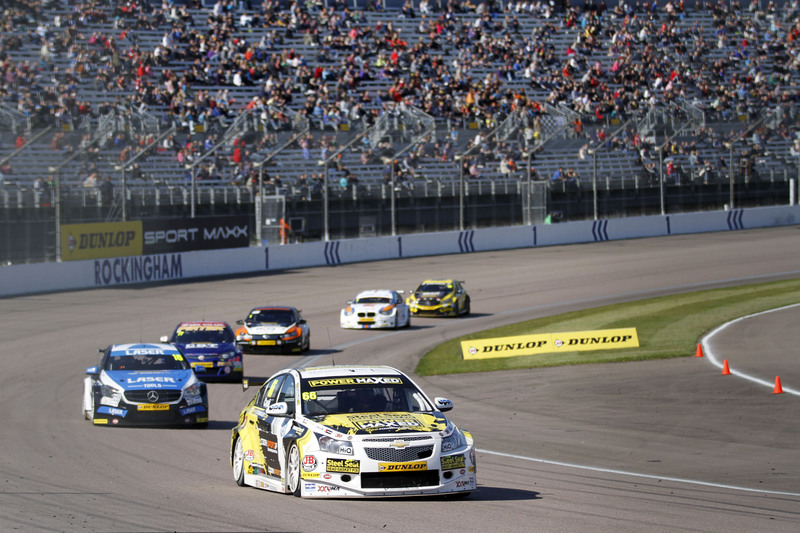 In the meantime, while the soft tyres began to fade, Goff was spearheading a pain train consisting of Turkington, Tordoff and the recovering Plato. As the flag dropped, Shedden brought home another victory ahead of Jackson and the sensational Cook. 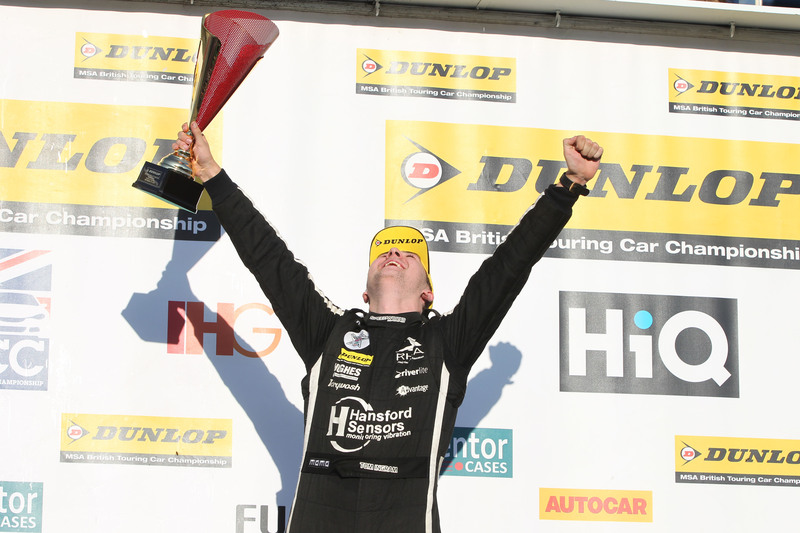 Great result also for Rob Austin who brought Sherman home 6th ahead of Plato, Turkington and Goff. The final race of the day is anything but boring or predictable; with Tingram gaining reverse grid pole from his 10th in race two, it moved the BMR boys of Turkington and Plato into a potentially race winning position. With the flying Cook starting in 8th for the final race, once again on the medium tyre, can he gain his first ever win while the carnage ensues around him? Will the battle of the gingers rage once more? There was only one way to find out! Race three would not last long for Goff who was spun out at the first corner, while Ingram shot off into an early lead, pursued by the daunting BMR twins of Plato and Turkington. 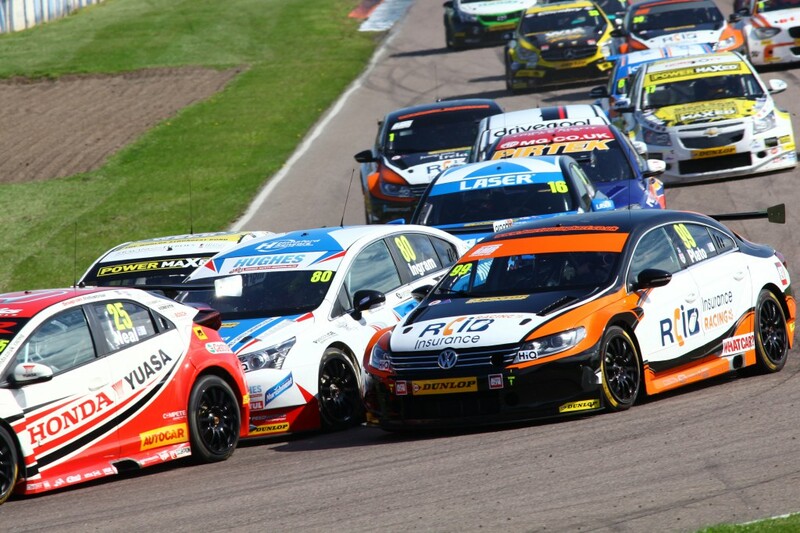 A great defense by Tom Ingram held off Plato despite his best efforts early on, which meant that Tom could back Plato up into the grips of Turkington and the ever approaching Neal. In a flashback to Donington, a great battle between Cook and Smith ensued, luckily without any collision this time. The eternal gods of the BTCC struck once again when a collision between Abbott and Bushell brought out the safety car. In the final race of the day, all the cars are bunched up. Let the pressure build up once again, a little more than those of Lewis Hamilton’s tyres in Monza! As the safety car pulls in, Plato appeared to return to old form by knocking Ingram around the first part of the track. Alas his efforts were not successful as Tom presents a stout defense. Even when Plato finds his way past, Tingram gives him a taste of his own medicine and muscles his way back into the lead. Inevitable race three contact between Morgan, Moffat, Tordoff and Cook helped shoot Morgan further down the order; a shame after his great effort in race one and two. To add to his woes, Morgan would discover the joys of playing in the sand pit himself, ruining what was a great race weekend for him until that point. Despite his epic defensive drive, Plato would eventually find a way past at the first hairpin, but due to Welch retiring on track the safety car once again came forth. The BTCC scriptwriters clearly made their decision that one more caution period would be enough for one final bout of action. Indeed, Plato’s restart was not enough to pull him away from the ever present Tingram who was on his case once more. As the cars hit the final lap, as Plato takes the chequered flag Moffat and Abbott have a huge coming together into the first corner. An astonishing drive and an astonishing result for Tom Ingram, who brought his Avensis home in 2nd ahead of reigning champion Colin Turkington. Many people seemed to give Jack Goff the ‘next big thing’ tag, but after that performance, I am willing to strip him of said title and give it to Ingram. It takes significant level of bravery to take on Plato and come out alive. And Tingram managed it. As we look forward to the final two race weekends of the year, it really is anybody’s race. The top 5 have utterly dominated the championship over the last 6 years, and are now covered only by 46 points. Based on the season so far, literally anything could happen over the next 6 rounds. Could Andrew Jordan become the first driver to win a title having not actually won a race throughout the year? Will the Plato v Shedden battle be their ultimate downfall? What is clear, is that the younger generation have shown their hand, and what a hand it is. Adam Morgan, Josh Cook and especially Tom Ingram have shown that the titans may soon be toppled. As the series moves onto Silverstone, the only way to find out what will happen is to be there. The End Begins: The Final Aussie Commodore Unveiled. Today, Holden has taken the covers off the quickest, most powerful, most advanced Commodore ever built, the Commodore VFII. VFII introduces a new 6.2-litre LS3 engine to all V8 models, along with numerous upgrades including bi-modal exhaust, mechanical sound enhancer and all-new styling cues. Making its debut at a special, custom-built Commodore Gallery at the brand’s headquarters in Port Melbourne, Holden today celebrated 37 years of Commodore by bringing together more than 30 Commodores, from one of the very first 1978 VB Commodores, to concepts, exports and motorsport heroes, illustrating the history and evolution of Australia’s favourite car. The 2016 Commodore VFII is equipped with the powerful LS3 6.2-litre V8 engine and delivers 304kW of power and an exhilarating 570Nm of torque, ensuring that this is the quickest Commodore ever, posting a 0-100km/h sprint time of 4.9 seconds. An engine of this caliber deserves a pure V8 soundtrack, so Holden engineers developed a distinct and fitting engine sound; the result of endless hours of local testing and courtesy of a newly introduced bi-modal exhaust with unique Holden designed “Baillie Tip” and mechanical sound enhancer. Building on the performance of the LS3 V8 engine, Holden’s track focused, top of the range, SSV Redline sees the introduction of Brembo brakes on all four wheels, providing exceptional braking performance under all conditions and specifically designed to perform under closed circuit and track day conditions. Holden’s Chairman and Managing Director, Mark Bernhard, described the Commodore VFII as the culmination of nearly four decades of design, engineering and manufacturing expertise, combined with unrivalled Australian experience. “We made a commitment to keep this iconic car exciting and relevant for Australian motorists, and that is exactly what we have done. This is the vehicle that our Commodore customers have been asking for,” said Mr. Bernhard. “Commodore VFII is powerful and refined, it will evoke emotion in its driver and exhibits all of the hallmarks Commodore has become renowned for over the years. “Commodore represents 37-years of innovation, performance and technological advancements and has earned its place as Holden’s longest-standing and most successful nameplate. “Holden’s design, engineering and manufacturing teams have produced the best Commodore ever – a vehicle that truly lives up to its reputation and one that the entire company is incredibly proud of. In addition to being the most powerful Commodore ever, VFII also boasts the exceptional refinement and handling that Holden has become famous for. Tuned at Holden’s Lang Lang proving ground and tested across Australia, VFII’s revised FE3 rear sports suspension increases ride comfort whilst retaining its sharp handling. Holden’s Lead Development Engineer, Amelinda Watt, said the extensive development work combined with Holden’s Australian expertise ensured the new engine, sound and handling was unique and thrilling. “The new 6.2-litre LS3 engine and its distinctive sound character is the result of years of hard work, testing, developing and evaluating this vehicle and I’m so proud of the end result,” said Ms. Watt. The introduction of functional hood vents and fascia ducts were developed by Holden engineers with support from Melbourne’s Monash University wind tunnel, improving aerodynamics around the front corners of the vehicle. Hood vents, a stunning new front fascia as well as the introduction of clear lens tail lamps on sedan models and new LED tail lamps on all Sportwagon models gives VFII a more aggressive exterior to match the LS3 V8 under the bonnet. Commodore VFII goes on sale in October with demand for the unbridled V8 variant expected to be extremely strong. Customers wishing to register their interests can do so at their local Holden dealer or via the Holden website. Holden’s Lifetime Capped Price Servicing, the largest of its kind in Australia, will also available on the Commodore VFII range rewarding customers with complete peace of mind. Private Fleet Car Review: 2015 Holden Cascada Convertible. Convertibles and Australia should go together like ham and pineapple on a pizza. It’s been tried by many. Many have failed. Holden has another go in 2015, with the Opel sourced Cascada 1.6L turbo four. A Wheel Thing runs the optics over it and likes some of what is seen. To kick it off, there’s immediately a problem. It’s a mix of lack of torque in a heavy car and a smallish fuel tank. Think 260 Nm, a 56L tank and a 1750 kg car. A six speed auto works well enough, but the ratios just don’t seem to offer enough to take advantage of the torque and when instant fuel economy of 40L per 100 kilometres is seen under acceleration that isn’t hard….economy is quoted as 7.5L per 100 km on a combined cycle. From the pickup point to home is near as damnit to 75 kilometres. Using a quarter of a tank to do so, in 95% freeway driving says more about this car than anything. On handover there was a quarter tank left after around 430 km covered. It ended up looking better than it could have been but part of the return journey was at speeds of twenty to thirty klicks, on a freeway. It’s fair to say that around town the economy would be something to give thought to. Acceleration is leisurely, rather than a sprint. There’s never a feeling of all of those torques hooking up from the six speed auto and being put down, with full effectiveness, to the road, with the weight taming any pretensions of speed the Cascada might aspire to. The mass also dulls rapid changes of direction, even with a low centre of gravity, plus the brake pedal needs adjusting for travel, with it feeling like an inch before any bite on the pads could be felt. Moving to the interior, it’s a sweet place to sit, roof up or down. Except for the centre console. It’s busy, very busy and one that a driver needs to study for some time before driving. There’s a button for every separate air conditioning function, including dials for the two zones. It’s overdone, par excellence’. Another downside is the somewhat cheap and chintzy feel the gear selector has, with a hard edged plastic feel to the button being pressed to unlock the movement. Other than that, it’s standard GM/Opel/Holden in switchgear on the nicely sized steering wheel, a red-orange monochrome display ahead of the driver and a classy look to the dials and layout in the binnacles, with touches of chrome brightening the black plastics. There’s a seven inch screen in the upper centre console that looks just like the one found in a Commodore, except that it’s a non touchscreen setup but does come with the similar apps. The extendable cushion in the front seats is handy, the padding and leather look is beautiful to behold however lacks ventilation (cooling) being heating only. Oh, by the way, there’s a heating function for the tiller…Another nifty touch is the mechanisms that power forward and back the holder for the seatbelts; hop in, twist the ignition and they travel forward a few inches, allaying any need to reach further back for the belts. The selling point of the Cascada is the convertible section. It’s a sweet one, taking under forty seconds from fully up, to down and back again. It’s operated by a small chromed lever in the centre console; pull and hold and the mechanisms do their thing, swiftly, smoothly and quietly, at velocities up to 50 kmh. There’s a window switch mounted inside the roof latch, for the rear windows, however all four raise and lower along with the roof’s programming. Rear vision is an issue, with a small window incorporated into the tough triple layered fabric roof. Small also applies to the rear seat space should a driver choose to move the seats back. The exterior is sleek, svelte, with the rise of the guards sweeping up into the A pillars in an almost unbroken sinuous curve. In profile the black fabric roof looks not at all out of place, with a view from the rear displaying a bold elegance to the look and tail lights. Bootspace is, understandably, tight, with enough room for some overnight bags and houses a space saver spare. Rolling stock is stylish 18 inch alloys with Potenza 235/50 rubber. Cascada sits on a 2695 mm wheelbase, with an overall length of 4696 mm, somehow managing to look smaller than that. It’s low, a trim 1443 mm whilst track, front and rear,is identical at 1587 mm. Holden quotes front headroom as 960 mm and rear as 917 mm. Cargo space is quoted as 280L with the roof folded, 380L up. Roadwise, the Cascada is a mixed bag. Steering is well weighted, precise enough but there’s a sensation of the rack being a bit loose whilst driving, with a feeling of movement from the front end being transmitted through the system to the driver. The ride quality in the Cascada was smooth but at times floaty, with the suspension absorbing bumps well but not tying down the chassis over repeated rises and falls in the road. The exhaust note is flat, uninspiring, sounding like an unwell vacuum cleaner. Roof up, there’s more noise allowed in via the thin rear windows than the roof itself. For roof down driving, a wind blocker is found in the boot and is easily installed thanks to spring loaded locating rods. At speeds up to 120 kmh, sure there’s road and wind noise but noticeable for the lack of intrusive turbulence thanks to the car’s canny engineering and aerodynamics. Cascada comes with a service interval of 9 months or 15000 kilometres and a new owner could be eligible for the Lifetime Capped Price Servicing. There’s also a year’s worth of Roadside Assistance included.